CreativityCorp software improves productivity through mobility worldwide. 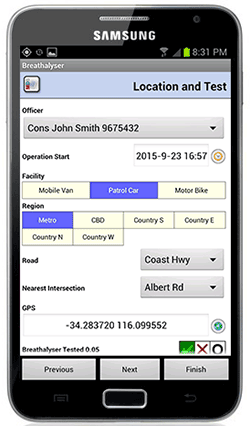 Our software enables data collection and management on Android, Apple, Windows 10 and Windows Mobile Smartphones, Tablets and Pocket PCs in business and government in over 50 countries. CreativityCorp also provides an online training environment to support mobile solutions and enable other enterprise training requirements. Mobile Data Studio is an integrated mobile project design studio, wireless client and server, and data management system. For Android, Apple, Windows 10 and Windows Mobile devices. Mobile Data Studio operates off-line and on-line, and is provided by a perpetual licence, not costly subscription. Periscope wirelessly and remotely projects the screen of Windows Mobile devices, controls PowerPoint presentations, and manages functions on Windows Mobile devices. SkillsCloud is a cloud computing based online training environment, to support deployment of mobile data projects, and as a cost-effective enterprise training solution. Be creative and productive with software by CreativityCorp. The Bushfire Ready Map project is available for Apple and for Android devices in Example projects with Mobile Data Studio. 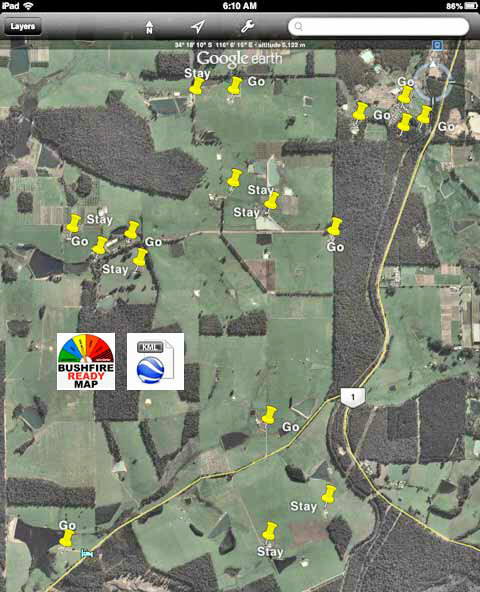 Enter bushfire or wildfire hazard and risk assessment data along with latitude and longitude captured by the GPS point to generate a KML file which can be opened in Google Earth; example shown below.